Jeremy Richman, whose six-year-old daughter Avielle was murdered in the 2012 Sandy Hook Elementary School shooting, has died of an apparent suicide. The 49-year-old was found at Edmond Town Hall on Monday (March 25) morning, according to the Hartford Courant, and the office of the chief medical examiner is looking into the exact cause of death. Richman’s passing comes after two students who attended Marjory Stoneman Douglas High School died of reported suicides in the last week. 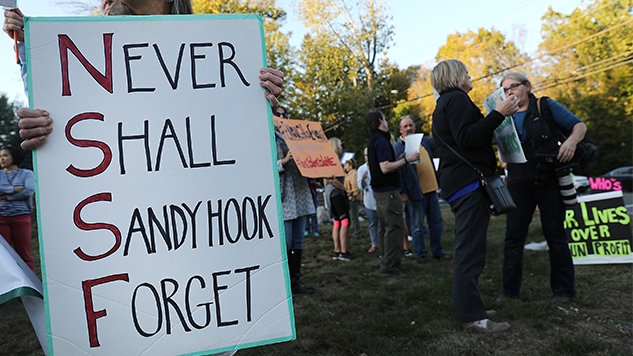 Following the mass shooting in the Connecticut school that left 20 first-grade students and six educators dead, Richman devoted himself to researching the neuroscience behind why people commit acts of violence. He started the Avielle Foundation, named after his late daughter, to spearhead this research and work towards preventing violence. “The cascading harm done by that savage, unspeakable act reminds us of the trauma that’s caused – and the after-effects,” Sen. Richard Blumenthal (D.-Conn.) told the Courant after learning of Richman’s death. He had come to know Richman and his family in the wake of the 2012 mass shooting. Just last week, two students from Marjory Stoneman Douglas High School—one graduated and one still attending—died from apparent suicides. Sydney Aiello graduated in 2018 and since the Valentine’s Day attack was diagnosed with post-traumatic stress disorder and suffered from survivor’s guilt, her mother Cara told CBS Miami. Aiello took her own life on Sunday, March 17. On Saturday, March 23, a second student from the school, whose identity remains undisclosed, died in what police said was “an apparent suicide.” It remains unclear if their death was connected to the Parkland shooting, in which 17 people were massacred. Activists from Parkland have since spoken out about the importance of mental health support for mass shooting survivors and victims’ friends and family. If you need to talk to someone, please call the National Suicide Prevention Lifeline at 1-800-273-8255.